I've been lazy with my postings lately. Well, that's not fair to myself. I haven't had much time to post lately. Hopefully, I will have something up regularly again soon. Fingers crossed. David Prior, a 54 year-old Mobile man, is the mastermind behind nearly 20 low-budget films since the late 1980s. 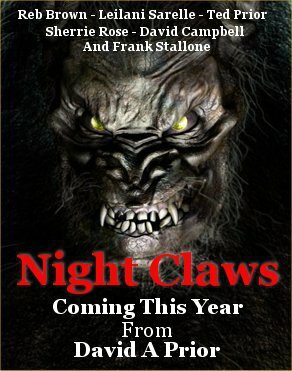 His latest effort sees Bigfoot stalking the piney woods of Mobile Co., AL in search of hotties to ravage and baddies to savage. 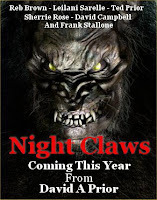 Night Claws is your classic fish out of water story. In this case, the fish are "east coast" types who find themselves at the mercy of the legendary beast who is, in turn, hunted by a local ruffian (David Campbell) and his two lackeys. Frank Stallone (yes, THE Frank Stallone) brushes past the lens a couple of times to lend what could only be considered "gravitas" to a film otherwise destined for the 2 for $5 bin. Principle shooting concludes April 9. Can't wait to see what magic happens in post production (likely there won't be any CGI). No word as yet on when the film will be released, but they do have a presence on Facebook, so check that if your hearts aflutter for a new D-grade biggy offering. What are your thoughts on this? Should we expect EVPs to be in the language of the land? And if not, do we think these are psychic projects? How would that be recorded? Or, more importantly, how would that be recorded in such a fashion that I would hear it in English, but a Chinese speaker would hear it in Mandarin? In the case of most pop-ups observed, the limestone has been lying under additional layers of limestone (or ice), and quarrying (or the retreat of a glacier) results in the sudden release of overburden weight holding the rock in place. The layer of limestone has been subjected, for a geologically long time, to the overburden, and this weight has been supported by stresses in the rock: because rock cannot deform by spreading out laterally, horizontal stresses exist in the rock as each piece pushes against its neighbor, supporting the load. When that load is removed, many of these lateral stresses may still exist, having been “locked in” the rock over geologic time; in some cases of quarries, the neighboring rocks still have the overburden weight on top of them, and the resulting lateral stresses can be large. Because the newly exposed layer no longer is confined from above, any small instability may initiate an upward buckling of the layer, which rapidly accelerates, resulting in a sudden noise and quite violent upheaval of rock (figure 11). 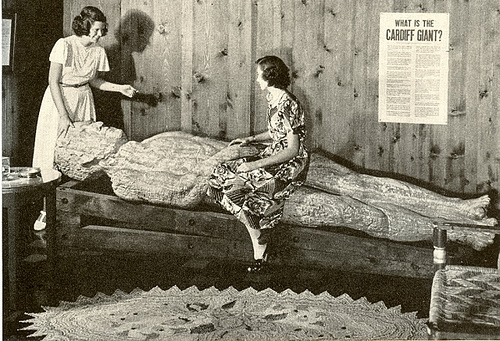 We are currently unaware of other examples of pop-ups that have been observed by humans that are not the result of quarrying operations; this may be the first known case of a contemporary pop-up that resulted from natural causes. Despite this lack of other modern examples, we postulate that the Menonimee Crack is a result of a limestone pop-up immediately beneath the ridge. The limestone violently buckled upward, heaving the uppermost rock layers and the overlying clay layer, resulting in the ridge (figure 12). The crack is simply a superficial feature, resulting from the stretching of the surface clay as it bent upward, much as a crack forms in the top of a loaf of bread as the dough rises. There are two remarkable aspects to this feature and the pop-up explanation: (1) there is no evidence for recent removal of the overburden that could have unloaded the limestone and triggering the buckling that initiates the pop-up; and (2) this is the first (to our knowledge) example of a modern, natural (not due to quarrying) pop-up that has been clearly documented by human observation. It is quite possible that other previously unexplained earthquake-like sounds and sensations have been due to similar events, but that the associated ridge (and crack) were never observed or reported. We have chosen to identify the sound and shaking that local residents experienced as evidence of an earthquake because the event fits the technical definition – a sudden movement of rock mass that resulted in the release of seismic energy through the earth. The event was too small to be recorded on seismographs, none of which are operating in the immediate area, but the observations of the residents clearly identify the seismic energy that was released, and formation of the ridge confirms that the sounds originated from rock movement. Therefore, this event can be labeled an earthquake, albeit a very small one, with magnitude of about 1 or 2. This classification means that it can be considered to be the first clearly documented earthquake in the Upper Peninsula that was not associated with an underground mine collapse (as are known from the Houghton/Hancock area in the early 1900’s, for example). This earthquake, however, has almost nothing in common with the usual concept of a natural tectonic earthquake, which would occur on a fault and result from large stresses rooted deeply within the earth’s crust. The limestone underneath the ridge has already had its stresses relieved, and is extremely unlikely to experience another, similar event. The areas beyond the current ridge and crack, to the SE and NW, may possibly be under stresses that are similar to those which caused the Menominee Crack, and could, conceivably, be at risk for a similar event. But because we do not (currently) understand what triggered this event, we do not know if another trigger could occur in those areas. The region is not experiencing increased stress that would result in future larger earthquakes. The stresses that caused this event were located in the uppermost few tens of feet, regardless of the (unknown) trigger, whereas large earthquakes result from stresses that are miles deep in the earth. Possibly predating dynastic Egypt, a strange sculpture with indecipherable inscriptions has finally gone on public display at a Vancouver museum after decades behind closed doors. The two opposing figures feature bulbous heads and thin limbs. A rare find? A hoax? Or something even more spectacular? "When they weren’t designing rocket ships or calculating how long it would take to cook the world with nuclear warheads, the RAND Corporation kept themselves busy working out how best to scare the hell out of ‘peasants, old people and… ignorant workers’, particularly in the Soviet Union. That anyway, was the aim of this fascinating 1950 paper, The Exploitation of Superstitions for Purposes of Psychological Warfare"
Get out your checkbook. Your next paranormal investigation might end up costing you. Recent difficulties in Maine have one group mulling over a city council's dictum that they will need to carry liability insurance and pay for a police presence if they wish to investigate the city hall in the small town of Hallowell. Often known by the Japanese word Nensha (念写), "thoughtography" is a psychographic technique to impart mental images onto certain surfaces, often film. Early experiments were conducted in Tokyo around 1910 by Tomokichi Fukurai using a psychic medium named Lkuko Nagao. Further experimentation with other psychics led to the publication of his book Toshi to Nensa. None of his work gained any acceptance, but he persisted until his death in 1952. Along the way, he founded the Fukurai Institute of Psychology. 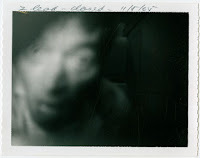 Ted Serios used Polaroid instant film in the 1960s to produce Nensha images under the auspices of a Denver psychiatrist, Jule Eisenbud. Their work together was chronicled in The World of Ted Serios: "Thoughtographic" studies of an extraoridnary mind." Whether Serios was truly gifted in this respect, we may never know; however, his psychopathic and sociopathic behavior makes him a difficult candidate for the veracity award. Uri Geller, the famed psychic, was another who claimed to possess this talent. However, these men have their critics. 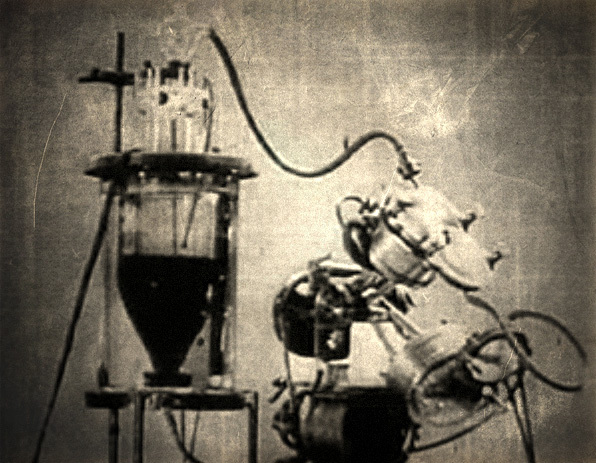 Those in witness of Serios' sessions noted that the "gizmo" the psychic required to make his images was, in fact, a miniaturized daguerreotype machine. Renown skeptic James Randi stated: "If Mr. Serios did not use a trick method, all the rules of physics, particularly of optics, everything developed by science over the past several centuries, must be rewritten to accommodate Eisenbud's opinion. No such revisions have been found necessary." I would agree. 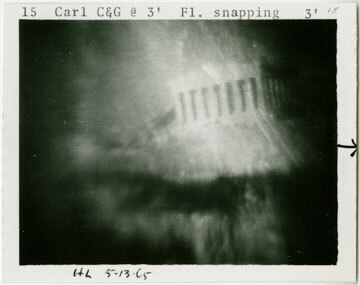 For instance, in Serios' images, focus and other optical distortions created only by the unique element of a camera lens can be found in his mental images. 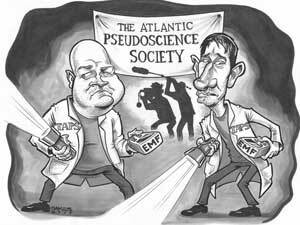 Why would this be the case, if the psychic projection presumably doesn't use a lens? You can examine Serios' work and learn about his bizarre history in an exhibition/lecture going on now. The University of Maryland, Baltimore County's Albin O. Kuhn Library Gallery is currently running Psychic Projections/Photographic Impressions: Paranormal Photographs from the Jule Eisenbud Collection on Ted Serios from January 26 through March 27, 2011. Visit the exhibition website here. On average, since 1900, there have been 134 7.0 or higher quakes each year. At least one will be an 8. There have been 174 7.0+ quakes between 2000 and 2011. However, between 1990 and 1999 there were 181. In the USGS's info of the largest quakes since 1900 (when records began), 4 have been in the first decade of this century. But 4 were also in the 1960s and 3 more prior to that in the 1950s. And, folks, there are only 15. Prior to this tragic quake, only about 50 fatalities were attributed to all the quakes over the past decade in Japan. However, in 1995 over 5,000 perished in Kobe and a whopping 143,000 perished around Kanto in 1923. Furthermore 222,000 died in Haiti in 2010, but 228,000 in Sumatra in 2004. The Indefatigable Atlantis Rises Once More To Tantalize With Its Timeless Tale. University of Hartford professor Richard Freund began with the much-studied works of Plato and ended up with a site near Cadiz, Spain he believe to be the location of the fabled lost city of Atlantis. Freund believes a massive tsunami swept inland for 60 miles, destroying Atlantis and other settlements. Archeological evidence has surfaced in central Spain, Freund says, of memorials to its destruction. 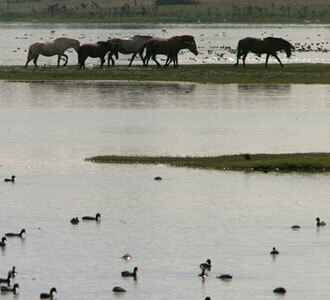 He is now looking beneath mud flats in Spain's Parque Nacional de Doñana. You may remember a small amount of excitement from Google satellite images that appeared to show the grid-like layout of a city beneath the waters off the Spanish coast. Google says this is a glitch, but I am willing to bet conspiracy theorists aren't letting that go. But if Atlantis was in an easier-to-visit spot near Cadiz, I'm sure they could be convinced. I also had my own thoughts on where Atlantis might be. I've done little investigation and this idea is mostly just speculation. The Best Evidence Of Paranormal Activity EVER!!! One February night in 1977, near Reagan, North Dakota, Mrs. Barney Strand, Jr. and her daughter, Sindy, were driving back to their ranch when they spotted a brilliant orb of light nearing their truck. It soon took up a position slightly above and behind their vehicle, dogging the duo for miles. Unnerved, Sindy accelerated faster, but the odd glowing ball kept pace effortlessly. Hoping the light would vanish once they made the turn onto the road leading toward their home, the women were startled to discover the noctilucent phenomenon maintained its pursuit. The pair leaped from the truck, raced to the house, and bolted inside where Mrs. Strand snatched up a pair of binoculars and watched their pursuer from a crack in the curtains. The orb hovered noiselessly near a stand of trees on the west side of the house. She watched in terrified amazement as the light pulsed and shimmered with a yellow-orange glow. The orb hung about for a few minutes before slowly vanishing in the distance. To Strand it seemed to twirl as it moved, spinning like a top. The mother and daughter weren't the first to spot the "Reagan Light." Over the preceding 24 months, others had reported similar encounters, often as they drove the lonesome back roads. The light would run parallel to the windows of cars, frightening occupants. Some blamed it all on a practical joker who had been shining a spotlight at motorists. To those who saw the three dimensional orb with its color-shifts and aggressive pursuits, the object could be no mere projected beam of light. Fact Or Faked Bonus: BIGFOOT VIDEO? 1) There is a reason to be shooting. Too many videos just seem to start up on the action or begin by panning around some location without any real context as to why on earth anyone would be filming that -- except, of course, to promote a hoax. This video has a family enjoying the pleasures of shooting stuff. 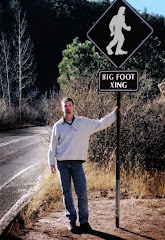 2) The focus is never on the bigfoot. It's practically out of frame for the scant seconds its visible. Instead, the focus is kept on the objects being shot and those doing the shooting. 3) No one drops a "what was that? ", which leaves us wondering ourselves. They don't claim it's a bigfoot, they merely present the video and ask if we think it might be. Given the helicopter they claim is hovering about, one wonders if they aren't after some fugitive--Dr. Richard Kimball, for instance. Here's the statement accompanying the video: "My husband and I took our kids target shooting. A helicopter was over our heads the entire time annoying us. We thought at first they were curious of why and what we were shooting. Later when we watched the video we noticed something that looked like Bigfoot running in the trees. We assume now the helicopter was hunting the Bigfoot. Scary." 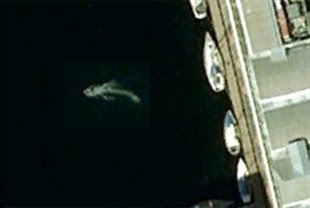 This "sea creature" was spotted near Liverpool, England during an examination of aerial and satellite images obtained from Google Earth. To some, it's unquestionably a Nessie-like monsters, while others believe it simply the wake of a small craft, such as a jet ski. Still others think it may represent a wandering basking shark. With ocean temperatures on the rise, some species are venturing into uncharted waters. More. I'm sure that my research will uncover more places to seek out between now and then. If you have any ideas on these fascinating places, I'd love to hear about it. I will also be in Lisboa (Lisbon), but haven't found out any stories there yet. a purported German expert on the Mayan language, Joachim Ritsteig, led a cadre of scientists to Guatemala on a treasure hunt Tuesday. According to reports, Rittsteig believes he has cracked the famed Dresden Codex (a collection of ancient Mayan writings), revealing that 8 tons of gold lie deep beneath the waters of Lake Izabal in eastern Guatemala. Rittsteig spent 40 years studying the Codex and now believes he understands it. In the work, he says the Maya wrote of their capital city Atlan and its demise in an earthquake on October 30, 666. According to his translations, 2,156 gold tablets--upon which the Maya recorded their laws--sank with the city into Lake Izabal. Radar scans of the region have pinpointed a location Rittsteig believes to be the site of the fabled city and its treasure. UPDATE: Here is an excellent counter-argument that refutes claims that lowland Maya ever inscribed law Hammurabi-style onto gold tablets (nay, had an abundance of gold in the first place or any codified laws either) or that the term 'Atlan' is of Mayan origin when it seems to be an intentional mistranslation by an Atlantis-obsessed German. It appeared as a floating two-story house with a glowing red interior. A week later, it has attracted national media and a team of investigators led by a former FBI agent who wants to know if the object was an alien spacecraft. 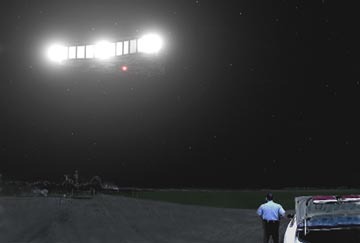 John Velier and his team from Las Vegas flew to St. Louis on Friday to learn more about a UFO spotted a week ago first by a miniature-golf course owner in Highland and then by four police officers. When it flew over Melvern Noll's head as he stood on his golf course about 4 a.m., the craft was traveling silently at a snail's pace. He said he saw at least two rows of windows and red lights inside the object and along its metallic dark belly. "I kept my eyeballs on it," said Noll, 66. "It was all lighted up and so low that someone could have waved at me out the window." He estimated it was about 1,000 feet above the ground. Noll said he drove to the Highland police station and asked the dispatcher to call the Lebanon police because the object was floating that way. Besides Noll, four Metro East-area police officers saw the object as it moved above Lebanon, Shiloh, Dupo and Millstadt. More than 20 calls about the sighting have been ringing into the Millstadt police station each day since it was first reported by the media Friday. Chief Ed Wilkerson posted his officers' report on the department's Web site along with the drawings and photo. He stopped media interviews, refusing inquires from ABC News in New York and Extra, the tabloid TV news show. "It's going to affect policing if we don't put a stop to it," he said. "I never thought anything like this would draw this much attention. Well, at least it puts Millstadt on the map." Police in Millstadt don't believe the sighting was a visitor from outer space. But they won't make any assumptions about what it was either. "This has been one of the biggest things we have experienced in this area. It's reached the world," Wilkerson said. Velier's team came from the National Institute for Discovery Science, a Las Vegas research institute, to collect evidence of the sighting. The institute, founded in 1995, has about a dozen former law enforcement officers and scientists investigating sightings professionally. "We are using the scientific method," said Colm Kelleher, an administrator for the institute. "We are looking for facts, not trying to promote any agenda." The institute sent a team to the Metro East area because of the overwhelming credibility of the witnesses - nearly all police officers, Kelleher said. "Police officers are a higher-quality observers than other witnesses, because they have good memories," he said. "And from our initial calls, we know these people are not delusional." Velier, who said he doesn't know if aliens exist or not, said he's now investigating about 136 cases of UFO sightings, as well as cattle mutilations. He interviewed the police officers and Noll. He couldn't find any other witnesses. "Usually we are inundated with people who have seen these objects," he said. Velier won't make an assumption about what the officers saw yet because his investigation is still in its initial stages. However, he will post a preliminary report on the organization's Web site at www.accessnv.com/nids in a few weeks. Two of the police officers who saw the object contacted the National UFO Reporting Center in Seattle the morning they spotted it, said Peter B. Davenport, the center's director. 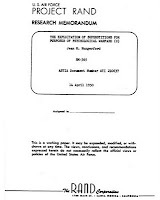 The center, founded in 1974, records, corroborates and documents reports from individuals who have witnessed unusual, possibly UFO-related events. The descriptions of the flying object don't fit conventional aircraft, Davenport said. The lighting is not consistent with U.S. regulations, and the flight pattern characteristics exceed anything that could have been achieved with an airplane, Davenport said. The center has also taken reports from at least two civilians in the area who saw the object while driving to work that morning. The center will not release their names. Forest Crawford of Collinsville, assistant director of the Illinois Mutual UFO Network, said he believes the police officers saw an experimental government aircraft. A couple of the police witnesses told reporters that the object resembled a drawing of a "stealth blimp" that appeared in Popular Mechanics magazine. "That drawing is such a close match to what these guys described," Crawford said. 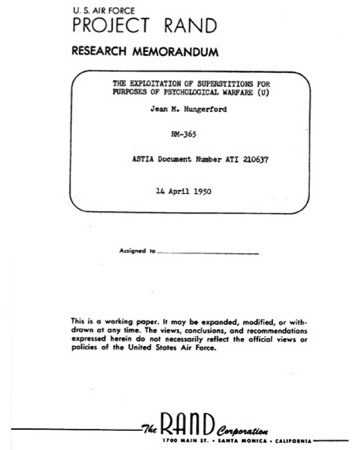 Davenport disputes the theory that the aircraft could have been a secret government "stealth blimp." The amount of power needed to generate the brilliant glowing lights would be generated from equipment too heavy for a blimp, he said. Officials at Scott Air Force Base said Tuesday that the only knowledge they had of last week's UFO sighting \was from news reports. The air traffic control tower for Scott and MidAmerica Airport was shut down at the time. Noll said although the sighting has brought lots of unexpected calls and attention, he doesn't regret telling his story. I'm glad I saw it. 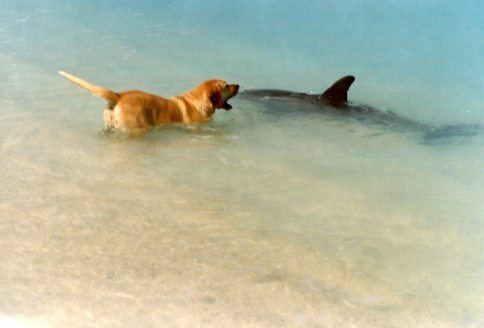 Only once in a lifetime you get to see something so exciting," he said. WANT TO KNOW MORE? Check out this site, which is full of what-happened-next information, albeit of the paranoid conspiracy type. 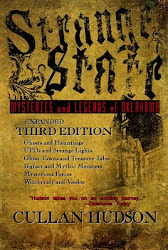 "Oklahomas longest running paranormal conference is set for April 23, 2011. Formerly known as OK-ParaCon, the new and improved "Ghostlahoma" event will offer a fun and friendly atmosphere while entertaining those that have an interest in Oklahoma History, Hauntings, Crypto-zoology and our forgotten history. The event lasts all day and vendor tables and sponsorships are available. The event is fun and interactive and everyone with an interest is encouraged to attend. Well behaved-Kids ages 12 and up are welcome. This years line up will feature Oklahomas top paranormal investigators, historians, authors, crypto-zoologists and photographers. The event will be held on Historic Route 66 in El Reno Oklahoma at the old Center Theater. After the conference guests are invited to attend the private and exclusive tours hosted by citizens of the city of El Reno. 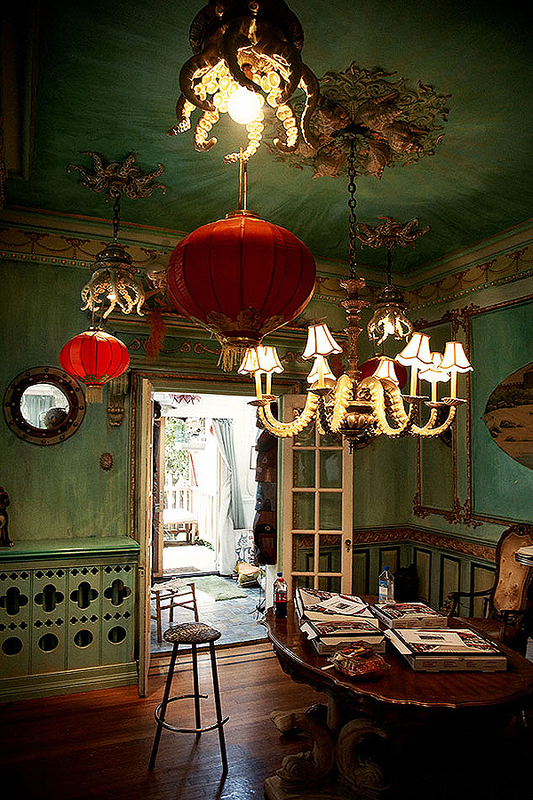 Step inside locations that have not been explored in years. Take a trolly ride or visit the well known Ft. Reno tours. While you are there, grab a world famous onion burger as seen on TV's "Diners-Drive-In's & Dives" and stroll along the sidewalks and enjoy shopping and local culture. Visit www.ghouli.org for details, information and ticket pricing." For a while, around the turn of the 20th Century, a legend was popular in Mobile, Alabama (the birthplace of Fat Tuesday in the US) during the Mardi Gras season. 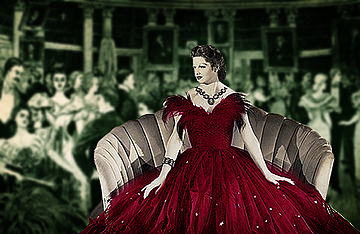 The story recounts how a poor but beautiful young woman had saved all her money to make the perfect ball gown, but before she could wear it to a ball on Fat Tuesday, she died of pneumonia. To honor the hard work that had gone into her gorgeous gown, the young lady was buried in the dress. Each Mardi Gras thereafter, reports of a mysterious and beautiful young woman in a pink ball gown would crop up. They said she dances and laughs and disappears, only to reappear elsewhere, as if she were trying to soak up every moment of her one day on earth. One popular (if sketchy) go-to website for ghostly information is www.shadowlands.net. While many people rely upon the site for details concerning local hauntings across the country, it is also filled with erroneous and fabricated tales that have no basis in fact--or even legend. As I have posted before, HERE, sites like these can be troublesome for researchers. While it might be a fine place to start when looking for local haunts, you will probably wish to follow up your interest with a visit to a library, bookstore, or more reputable websites. 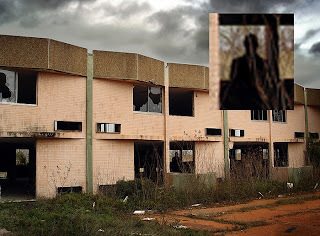 "In the behind-the-scenes area of the Aquatics [sic] building, a ghost of a woman with long hair has been seen at various times, usually at night, by several different people. No one has any idea of who she is or where she came from, much less why she is there." Myself and others questioned this story when we first caught wind of it. I exhaustively researched legends from across the state in compiling my book. Not once did I come across even the most oblique reference to any spirit haunting the Oklahoma City Zoo. Puzzled by this, I inquired further. What I learned from the zoo's marketing and public relations manager, Candice Rennels, was that "the rumors are just that--rumors." While not an outright dismissal, Rennels does intimate that the story doesn't exist within the zoo walls. This makes sense. In researching nearly a century of newspaper accounts concerning the zoo, not once did anything ghostly crop up. True, the zoo holds a Halloween trick or treat romp for kids each year, but this event is more awwww than awful. "Some people say if you go there at night the books will fly off their shelves at you." My paranormal-loving mother has a Masters of Library and Information Studies from the University of Oklahoma and did undergraduate work in History. She knows her way around a library and a good story. More importantly, she worked at this and other libraries in the Oklahoma City area for years. She has been in the library countless times after hours without a single experience to report. She has also spoken with other librarians, staff members, and security guards--some of whom had called the Choctaw Library home for decades. Not a single one of them claimed to have experienced anything bizarre, unexplainable, or supernatural. The story is entirely fictitious. I think the same may be going on with the ghost at the Oklahoma City Zoo. I am fairly certain the tale can't be supported by fact, but I've got a good feeling that it won't be corroborated by legend either. Whatever you may hear in the future regarding the zoo ghost, I urge you to take it with a grain of salt. However, if you have further information concerning the alleged haunting, I would be interested in learning more. I am especially keen to talk with any current or former employees. According to findings published in the Journal of Cosmology, Dr. Richard B. Hoover (NASA) has discovered evidence of alien fossils in a rare type of meteorite. 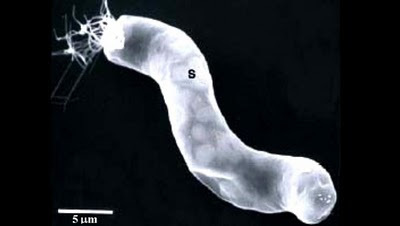 The bacteria is visible only with scanning electron microscope, but Hoover believes his peer-reviewable work will eventually bear out the hypothesis that extraterrestrial life exists. Learn More. In honor of the new season of Fact or Faked (premieres March 23rd on SyFy), I have decided to pose this very same question to you. Is the following image fact or faked? Just reply in the comments and explain why you think so. A little background: This is an old Ramada that was abandoned after succumbing to the wrath of a hurricane that hit the gulf coast some years back. The entire area sits only inches above the water, so any storm surge would wipe out businesses and homes easily. There were no other homes, businesses, or anything around where this hotel stands except a shrimp and crab restaurant, but it wasn't open yet. The workers weren't even there. No one else was in the entire hotel (I covered most of the floors). No cars and it's a long walk to the nearest... anything. The whole place is rather remote. Cryptozoologist, Craig Woolheater, of the Texas Bigfoot Research Conservancy, uncovered this rare country music gem about Oklahoma's Boggy Bottom Monster, a Sasquatch-like creature that terrorized the denizens Atoka County for decades. He posted the following YouTube video on Cryptomundo, where you can read more about the artist, Perley Curtis. While it isn't clear what the precise impetus was for writing about the beast, Perley has certainly captured that type of country ballad we so seldom hear these days. Enjoy. 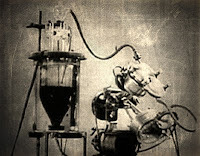 Russian Experiments In The 1940s At Keeping Discrete Organic Components "Alive"
In something out of the X-Files (the film I Want To Believe, to be specific), a 1940s-era Russian film extols the prowess of Soviet science at reanimating various organs and even a dog's entire head. However, some dispute the veracity of the film, citing several physiological impossibilities and dismissing the work as Soviet propaganda. Others feel that, although doubtlessly dramatized, the documentary reflects real work being carried out at the time in Russian laboratories. Either way you slice it, it's easy to see why Chris Carter was drawn to it for his last installment in the X-Files franchise. Read More. Across The Forest: Tales From Transylvania examines the long-held superstitions and myths of that ancient country by talking to the people themselves. Many documentarians have tread this well worn path, but Justin Blair and Matthew Vincent traveled to that storied land to learn what Transylvanians themselves have to say about these supernatural entities who have been fodder for so much pop culture over the past century. You can visit their website and blog to learn more. The documentary suffers terribly from a total lack of marketing. There isn't even proper cover art. And the production quality is nonexistent--being shot on a camcorder. Still, for $9.99, what can one expect? Filmmakers these are not, but there's an intimacy and earnest quality to the work, as if you are there with them speaking to these people about the legends and fears that still seem so real. No fancy (and overly abused) Travel Channel post production effects here. Just the camera, the people, and their stories. Desperate hopes build over at Cryptomundo regarding "The Erickson Project" and the reportedly first good look at the face of a sasquatch. "This could be the most exciting news in years," Loren Coleman writes. It's likely a viral marketing campaign to arouse interest in some forthcoming mockumentary or low-budget horror film. Or worse, another P. T. Barnum Feejee Mermaid video, the likes of which the bigfoot community has too many already. But this won't quell the giddy excitement of some that FINALLY there is proof. I've made the analogy to Charlie Brown always getting football pulled out from him before, but I think it bears repeating. The YouTube link that purports to show the Erickson Project footage dicks around for several minutes (to a delightful bossa nova number) as it counts down to the #1 best biggy footage. It builds the suspense with a lot of text about what you will see, but pulls the football out from under us by not delivering the goods. WARNING BELL. The poster, trailriderresearch, has also posted UFO footage, recordings of sasquatch 'night whistles', an unseen, but purported bigfoot throwing rocks, and others. The entity seems to be a person known as "Bruce" from Vancouver. I can't confirm that trailriderresearch is related to "The Erickson Project," but I am willing to bet he is. This was posted in October of last year: "After viewing the trailer I cannot help but turn away from the heavy dose of cryptic marketing with that familiar feeling that there may be another outbreak of Biscarditis in the offing. If so, the ship of Bigfootery Research will have sustained another broadside direct hit in it's hull and may begin taking on water faster than the minions can min the pumps. Hope I'm wrong tho'." Learn more about the Project at their website questforsasquatch.com, but I urge caution. At best, this is a "group" formed for the soul purpose of making a video to cash in on all things bigfoot and will likely be pitching this to every cable outlet likely to run it. At worst, we're looking at another hoax. Either way, I don't expect much and I'm surprised at how excited some people seem to be getting about this. PaleoBabble exposes what fools among giants men must be. Fact or Faked returns for a new season on SyFy come March 23rd. The Façade is a novel that works to craft a "unified field theory" of the paranormal, hanging "fact" from the framework of a fictional narrative. Scientists of disparate disciplines are culled against their will to join a top-secret government cabal that plumbs the various paranormal mysteries, discovering a connecting thread running among them. If this sounds familiar, you might be watching something like Fringe on FOX. I haven't read the book, but it might be a fun summer read. And Anthony Bragalia rips the sheet off the probing table as he takes a closer look at alleged 'alien abductions' over at UFO Iconoclast(s).